One of the first things a divorce attorney may ask for is your spouse's identity. He does this to verify that your spouse hasn't already consulted him. If he has, he'll politely tell you that he can't speak with you further. Likewise, if your spouse comes to him for a consultation after you've already hired him, the attorney will decline to speak with him. Attorneys are not allowed to represent both spouses in a divorce except in very limited circumstances that involve both spouses' written consent. And even then, most attorneys decline to do so. It should help you feel more secure in your relationship with your attorney to know that his loyalty is to you alone; your spouse, no matter how persuasive, can do nothing to disturb that loyalty. 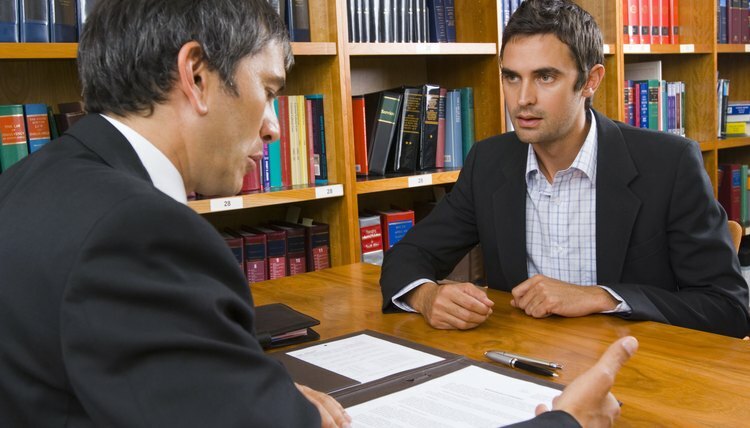 Attorney-client privilege starts when you sign a retainer agreement hiring an attorney, and lasts indefinitely. With few exceptions, your divorce attorney is legally required to keep your information confidential. He can't repeat to anyone what you've told him in the course of your case unless you discuss it first. The privilege covers the attorney's staff, so you may discuss private matters in front of them without waiving the privilege. An exception to this rule is if you sue the attorney for malpractice, your attorney can testify against you and discuss otherwise privileged information while on the stand. He also can turn you over to the authorities if you threaten to kill or seriously hurt someone. Some states, such as California, also allow attorneys to turn you in if you seek their help to commit fraud. Your divorce attorney has responsibility to represent you zealously, which means he must do everything within his power, within the bounds of ethics and the law, to represent your case and work toward your desired outcome. This, however, doesn't mean crushing your spouse or employing unlawful means to get information to use against him. Your lawyer has a responsibility to communicate with you through the various phases of your divorce. Some attorneys fulfill this responsibility by sending you copies of all documents filed on your behalf and received from your spouses attorney that have been filed on his behalf. Your attorney also must present to you any offers of settlement that he considers reasonable, so that you may make the final decision of acceptance or rejection. All attorneys, no matter their area of practice, cannot charge exorbitant fees. Exorbitant is decided within the context of the type of law involved and the complexity of the case. In addition, the attorney's fee structure must be clearly defined and should be presented to you in writing. This is usually taken care of in the compensation section of the attorney retainer agreement. A divorce attorney specifically is bound by an additional requirement. In family law cases, he may not require or agree to a contingency fee arrangement, where payment of his fee requires he first secure your divorce, or some specific outcome in the divorce settlement. A contingency fee agreement is an arrangement in which a lawyer is only paid if he wins his client's case. Typically, the fee agreement will set out a percentage of the settlement amount that will be paid to the attorney on successful completion of the case. Attorneys will generally only work on contingency when there is a situation involving a substantial amount of money. Charging on a contingency basis is only allowed in civil law -- lawyers may not take criminal cases on contingency. Hiring an attorney on contingency can help low-income clients afford representation. It's possible for a spouse to disappear midway through divorce proceedings, especially if he doesn’t want the divorce. Many people believe that if they don’t participate, the divorce can’t go through. This has no basis in fact. The court will finalize the divorce without your spouse's participation. However, his disappearance will undoubtedly complicate the divorce for a while and slow its progress.